Saying goodbye to our college daughter on the steps of her freshman dorm last fall was a moment marked with a long hug, a few tears and a dollop of heartache. 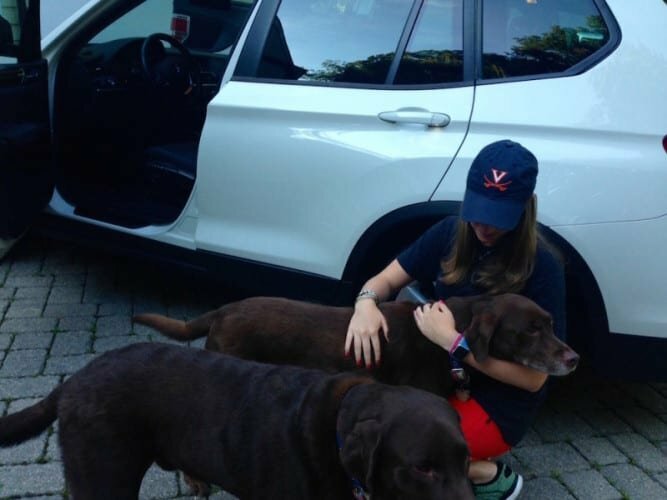 This semester, she will have a car at college and my anguish will begin when we say our goodbyes and not diminish until we get the text from her with that beautiful 4-letter word, “here.” Before she goes, here’s how I can help her prepare to drive safely back to college. We receive small amounts of compensation from purchases made through some of these links which helps us pay our writers. 1. Jumper Cables – a dead battery is a relatively easy fix with a set of jumper cables and the knowledge of how to use them. A step-by-step guide on the safe way to jump-start a car can be found here. Consider printing them out, reviewing with your teen and folding them into the glove box where she can find them if need be. battery charging device that Consumer Reports gives high marks to. It makes the entire process so much easier than conventional charger cables since no other car is required to jump the dead battery. Plus, it has the added bonus of being able to charge personal electronics, as well. 2. Reflector Triangles – being visible is crucial if a car is broken down on the side of the road and a reflector triangle in the trunk could be invaluable. 3. Car jack – make sure it is a compatible size for the car. – thorough there may not be snow on the ground when your teen drives back to school, go ahead and get them ready for snow and ice. 6. E‑ZPass– a time saver and great convenience on toll roads in 17 states in the eastern part of the US, an E‑ZPass device mounted on the front windshield of the car will save your teen time and money as he won’t have to stop (often in long lines) at toll booths along the way. 7. Hands Free Phone Mount – holding a phone while looking at directions or glancing to read a text is dangerous and could result in a ticket, too. This popular dashboard mount solves the problem. We found these tips from the National Safety Council but also recommend scheduling an appointment with a car dealership or mechanic to for a pre-road trip check. 8. Tires – check for proper inflation, alignment, and tread. Have they been rotated according to the recommended tire rotation schedule? 9. 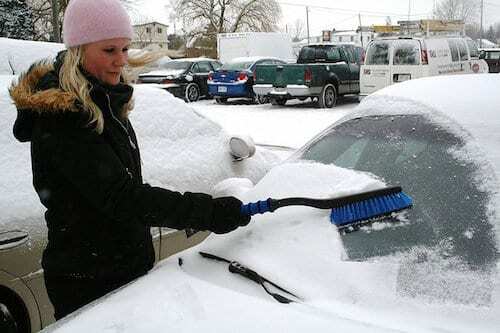 Wiper Blades – still working or is it time to replace? . 10. Fluids – Battery fluid, brake fluid, coolant, oil, transmission fluid, windshield wiper fluid all need to be at proper levels. 11. Lights – brake lights, headlights, turn signals should be checked. 12. Belts and hoses – look for cracks or bulges; if over four years old, they need to be replaced. If your teen feels that they are losing power, hears an unfamiliar sound, or has a tire blow-out, here’s what to do. Go through these five points with your teen well before he is packed and ready to go. 13. Slow down – your teen should resist the urge to slam on the brakes and should, instead, gradually decrease speed. 14. Use the indicators – indicators and hazard lights will show others what the driver is trying to do. Make sure your teen knows where these buttons are. 15. Be seen – after driving to a safe spot off the highway, keep the flashers going, raise the hood, and place a reflector triangle behind the car, especially if this occurs during the night. 16. Call for help – your teen should take note of any highway signs or landmarks to give police an idea of where he is stranded. 17. Stay away from the road – remind your teen to never walk in the road, even to get tools or supplies out of the trunk, but should slide over and get out of the car on the passenger side. Further, he should stand far away from the car while waiting for help. 18. Roadside assistance – who should your teen call if they have car trouble on the road? While they will want to phone you for help, they need to know who to call for roadside assistance. Options may include the family insurance provider, AAA, or, possibly, the manufacturer of the car. Take time, before your teen leaves for college, to explore which will be most responsive. Make sure they have the number in the car and a fully charged cell phone. 19. Ownership documents – if your teen is pulled over or needs the help of a policeman, she will need the registration and insurance card along with her driver’s license. Does she know where each of these are kept? 20. Owner’s’ Manual – a wealth of information about the recommended operation of the car, this is one reference book that he needs to refer to while owning the car. 21. Accident report – in case your teen is involved in an accident, would he know what information to collect from another driver? After calling the police and 911 if anyone is hurt, collect contact information, driver’s license number, insurance policy account and phone numbers and while standing at a safe spot near the scene. Take pictures of damage to your car and theirs, too. One final thought, my favorite app to use for navigation is Waze. After loading in the destination address, Waze will offer several different routes and expected arrival times. It will alert drivers to accidents or hazards along the way, too. This is a great help for your teen to drive safely back to college.